Magna Expo Mueblera is the most important commercial exhibition in Mexico focused on the supply of technology, machinery, material and equipment for the forestry, timber and furniture industries, aimed at the professional public at this segment. The opening event for Magna Expo Mueblera is going to take place today at 11:30 a.m. in the foyer of the Centro Banamex exhibition complex in Mexico City. Eumabois President Jürgen Köppel will kick off the Magna Expo Mueblera exhibition jointly with Christian Pfeiffer, Global Director of LIGNA and Woodworking Events at Hannover-based Deutsche Messe, along with Bernd Rohde, General Manager of Hannover Fairs México. “Magna Expo Mueblera represents the ideal regional platform for sharing ideas and know-how. Thanks in particular to the commitment of the LIGNA organizers, with their dense international network and solid expertise, Magna Expo Mueblera has become the industry’s most successful trade fair. We wish every participant interesting conversations and good business,” declared Jürgen Köppel during the run-up to Magna Expo Mueblera. Leading figures from business and politics are expected to attend the kick-off event, with experts offering an upbeat forecast for the Mexican timber industry. The production of wood products such as windows, doors and floors is being continuously modernized, as European woodworking machine manufac¬turers continue to establish themselves as reliable and dynamic partners for Mexican wood product manufacturers. 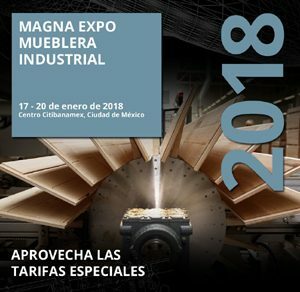 Two international trade fairs will be staged under the umbrella of the Magna Expo Mueblera trade fair, which runs from January 17 to 20, 2018: Magna Expo Mueblera Industrial, showcasing machinery, tools, equipment and solutions for woodworking and wood processing, and Magna Expo Mobiliario e Interiores, which features furniture, decorations, household appliances and floor coverings. Joining market leaders like Altendorf GmbH, Leitz GmbH & Co. KG, the SCM Group, Stiles Machinery Inc. and Michael Weinig AG/Holzher, the Biesse Group (Italy) has confirmed its participation in the Magna Expo Mueblera Industrial trade fair which will last till January 20. Represented by their Mexican subsidiary Hannover Fairs México, the organizers at Deutsche Messe (based in Hannover, Germany) have already reported a high rate of exhibitor participation from abroad. “Particularly gratifying is the high number of signups for the official German group pavilion at Magna Expo Mueblera Industrial, which is sponsored by the German Federal Ministry of Economics and Energy,” commented Christian Pfeiffer, Global Director of LIGNA and Woodworking Events from the Deutsche Messe head office in Hannover. Companies showcasing their products and solutions at the event include Baumer Inspection GmbH, Dieffenbacher GmbH Maschinen- und Anlagenbau with its Shanghai Wood-Based Panel Machinery Co., Ltd., Fagus-GreCon Greten GmbH and Co. KG, Hans Weber Maschinenfabrik GmbH, imos AG, Heinrich Kuper GmbH & Co. KG, the German Forestry Council (KWF), Pallmann Maschinenfabrik GmbH & Co. KG, Siempelkamp Maschinen- und Anlagenbau GmbH, TIGRA GmbH and Venjakob Maschinenbau GmbH & Co. KG. A Swedish Pavilion will be a notable first at Magna Expo Mueblera Industrial. Scores of machines will be on display at the trade fair, live and in action – presented by companies ranging from local suppliers all the way up to the major players,” said Pfeiffer.